You don’t have to be a gung-ho Lance Armstrong athlete to enjoy the benefits of riding a bicycle around Austin, Texas. Hop on a hydrobike for a fun experience that lets you burn calories and stay cool at the same time. 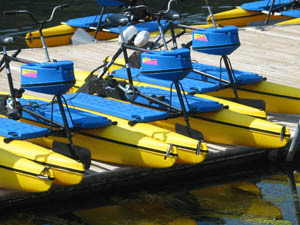 World-renown Lake Austin Resort Spa provides hydrobikes as an optional activity for guests, and you can rent hydrobikes on Lady Bird Lake in downtown Austin. This is not your granny’s paddleboat but a real bike frame perched on pontoon-like floats and powered by your pedaling action. Hydrobiking allows you to enjoy the scenery and perhaps catch a glimpse of shoreline wild life because you sit higher than in a kayak. The bike is also more stable than a paddleboard, and you control the speed of your journey (and the intensity of your workout). Pedaling a hydrobike rivals the cardio benefits of aerobics without the required energy expenditure. At Lake Austin Spa Resort in Austin, Texas, instructors guide participants through a half hour cycling workout. Hydrobiking at a moderate level of exertion--50 to 60 percent of your maximum effort—burns more calories than high impact aerobics, swimming, or kayaking. Because of added resistance from the water, your workout is similar to biking up an incline or against a head wind. But there’s no jarring sensation in the spine because you sit in a comfortable upright position, and water cushions the ride. Overall, it’s a low impact exercise that is easy on the body and soothing for the mind. Since there’s no motor on hydrobikes, there’s no noise, and you can easily have a conversation when a friend rides along. The pontoon-like floats keep you high above the water, so you don’t even get wet. Hydrobikes are safe for all ages (it’s a really cool family activity) since the flotation factor makes them easy to ride, and they won’t tip over. They are lightweight with ergonomically correct handlebars and adjustable seats. Rent hydrobikes from Austin Water Bikes on Lady Bird Lake. 512-200-6555. Cost is $22 per hour or $13 per half hours. www.austinwaterbikes.com. For information about Lake Austin Spa Resort call 800-847-5637 or click www.lakeaustin.com. If you have ridden a hydrobike, tell us about your experience in Comments below.